It is just days before Easter and housewife Laure Bertini walks the aisles of the Manor supermarket in downtown Geneva, looking for holiday treats. “Chocolate will always be at the top of my shopping list, regardless of the economy,” she says, filling her cart with gold-foil-wrapped chocolate bunnies from the Swiss maker Lindt. On the other side of the aisle, German tourist Werner Meier also eyes the wide array of chocolates. The fact that his country is facing its biggest economic crisis since World War II doesn’t deter the retired engineer from buying eight bunnies  at $4.50 a pop  and 20 milk chocolate hazelnut bars for his family back in Hamburg. “We may not be able to buy luxuries any more, but we can still splurge on small pleasures like chocolate,” he laughs. It’s a sentiment that many share, and not just around Easter. While the credit crisis has slowed down sales of everything from cars to organic groceries, people seem happy to keep shelling out for chocolate. Last year, as the global recession was gaining ground, Swiss chocolate makers bucked the trend with record sales  nearly 185,000 tons, an increase of 2% over 2007, sold domestically and in 140 export markets. 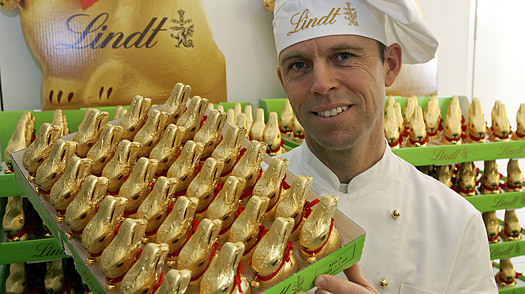 And while figures for the first quarter of this year are not available yet, “so far we have heard positive and optimistic reports from chocolate companies,” says Franz Schmid, managing director of Chocosuisse, an umbrella organization for Switzerland’s chocolate industry. Although Swiss brands may not take the biggest bite out of the global chocolate market  that honor goes to the U.S. company Mars-Wrigley and Britain’s Cadbury  they are widely considered among the best and most competitive in the world. “Switzerland’s image sells well abroad, and nothing says ‘Switzerland’ more than chocolate,” says Stephane Garelli, director of the World Competitiveness Center at the Institute of Management Development in Lausanne, predicting that this comfort food will continue to sweeten the sour economy for months to come. That view is also shared by the Zurich-based Barry Callebaut, one of the world’s leading manufacturers of industrial cocoa and chocolate. The company maintained stable sales volumes and increased profits by 4.7% in the fiscal period ending in February of this year, which spokeswoman Josiane Kremer attributes to the firm’s expansion into high-growth emerging markets such as Eastern Europe, Russia and China, as well as market share gains in North America. And it’s not only Swiss chocolate makers who are thriving while others are struggling. The recession-bucking trend is also reported by Cadbury, which is expecting to deliver a 4-6% growth in 2009, and by U.S. manufacturer Hershey, whose predicted net sales growth for this year is in the range of 2-3%. Which goes to show that chocolate is more than a candy treat  it’s real food for the soul.